Two brothers lived in the land of Judah during the time of King Solomon. They were both wheat farmers and through the years always shared equally the profit from their harvest. One night the elder brother went to his barn, and in the dim light of the moon loaded up several bushels from his harvest. He crept through the fields between the houses and left the grain in his brother’s bin. He said to himself, “My brother has seven children and with so many mouths to feed, he could surely benefit from some of my bounty”. The next day when dawn came and the sun lit the sky, each brother was amazed when he went to his barn and discovered that he had just as much wheat as before he had taken any out to deliver to the other. The next night each brother paid the other the same kindness. And so it went on for years. Each morning they were amazed and puzzled by the miracle that occurred each night. Enjoy the remaining days of Christmastime as we join the Magi of Epiphany in offering gifts to the newborn Jesus. May the gifts we give and receive through this new year strengthen the bonds of friendship and love we share. You can view all of Msgr. 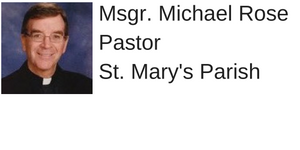 Mike's posts on the parish website by clicking here!